We’ll discuss medical history, behavior changes, lifestyle, nutrition, and address any concerns you may have. At these visits, we’ll formulate strategies and talk about supplements that will keep your pet feeling her best. Complete a Home Care Survey before your visit! We’ll check your pet from nose to tail for tumors, signs of pain, or arthritis. We will assess his overall appearance, scanning his eyes, ears, nose, and mouth for irregularities as well as listening to his heart and lungs. Once a year, we will do a blood test to screen for heartworm disease. Heartworm disease is a parasitic infection transmitted by mosquitoes. Symptoms may include mild persistent cough, fatigue, being tired after moderate exercise, weight loss, and reduced appetite. Once a year, we will do a blood test to screen for three tick-borne diseases (Lyme, Ehrlichiosis, and Anaplasmosis). Ehrlichiosis is a bacterial infection transmitted from the bite of an infected tick. Symptoms may include loss of appetite, depression, lameness, swollen or painful joints, bloody nose, and pale gums. 24% of dogs in Taney County test positive for Ehrlichiosis. A microscopic examination of a stool sample checks for common intestinal parasites like roundworms, hookworms, whipworms, giardia, coccidia, etc. Complete Blood Counts (CBC) and a Basic Chemistry Panel can be added on to preventive care visits. This preventive care testing is very important for us to spot potential health issues before your pet shows symptoms, and to obtain a baseline of blood values while your pet is healthy. The chemistry panel evaluates organ functions and screens for presence of diabetes and other disorders. A CBC is used to screen for: anemia, inflammation, infection, stress, leukemia, bleeding problems, hydration, and ability to fight infection. ​An ideal fast for wellness blood screening is 8-12 hours. Complete Blood Counts (CBC), a 26-point Chemistry Panel, a Thyroid Screen, and a Urinalysis can be added on to preventive care visits. This chemistry panel evaluates organ function (liver and kidneys), electrolytes, triglycerides, and screens for presence of diabetes and other endocrine disorders. ​Thyroid hormones control how quickly the body uses energy. Thyroid function can become abnormal and cause illness. A physical, chemical, and microscopic evaluation of urine provides additional information about kidney and liver health, and screens for urinary tract disease. We vaccinate in order to prevent common bacterial and viral infections. 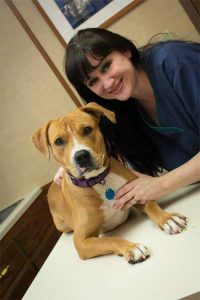 For canine patients, we include vaccinations for distemper, parvovirus, hepatitis, and rabies. We also recommend vaccines protecting against leptospirosis and bordetella in a lot of circumstances based on your dog’s lifestyle. If your dog goes to grooming and boarding facilities or dog parks, your dog will need to be current on her bordetella vaccination. This vaccination is usually required by these facilities to help prevent respiratory outbreaks. Leptospirosis is a disease transmitted through the urine of rodents, deer, and other wildlife. This has actually become a problem in some cities due to transmission from rodent urine. If your dog spends time where wildlife are active, our guidelines strongly encourage vaccinating to prevent this deadly disease.